I’m kind of picky when it comes to graphic shirts. The design really has to be cool and complicated a the same time yet work with the basics of what I have in my closet. This morning, I received a promotional email from Threadless for their $10-12 shirts and tanks. I quickly browsed through the meaningless geometric prints, cutesy talking burgers and fries, even the I’m-trying-too-hard-to-be-different statement shirts. I found nothing for the first 18 pages of print-ready designs. 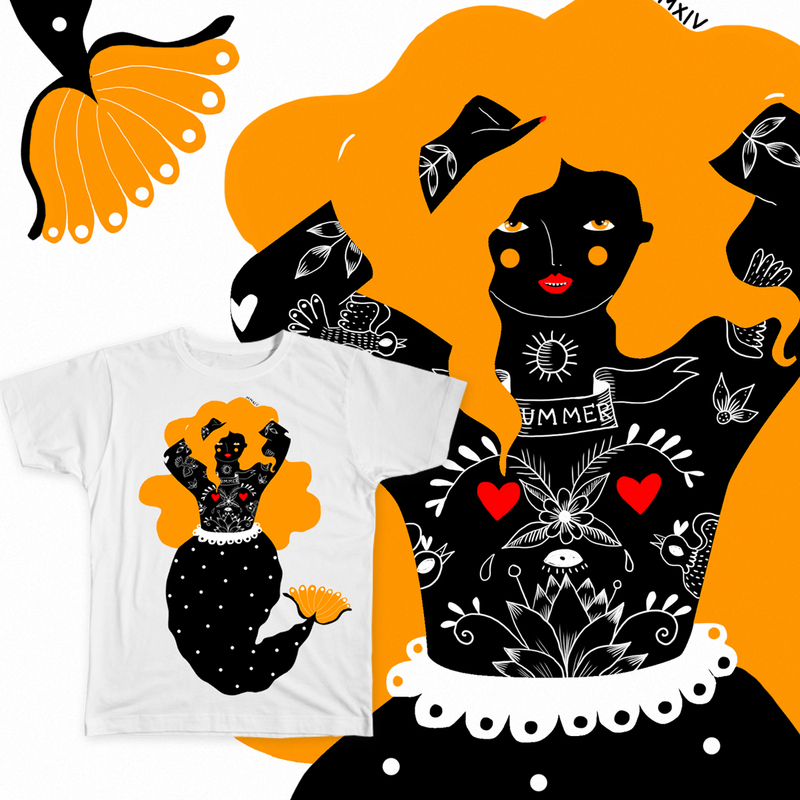 Then I stumbled upon shirt with a round mermaid (named Fever) with orange hair, manifested by a graphic genius named Heliana, a 28-year-old Romanian artist who goes by pink.aitch. I fell in love with the extreme contrast and the fact that this chubby mermaid had fancy lace around her waist. Unfortunately a lot of the coolest designs that pink.aitch uploaded to print were no longer available. Bummer. So I kept browsing through pink.aitch’s products hoping to find something of hers that I could buy. 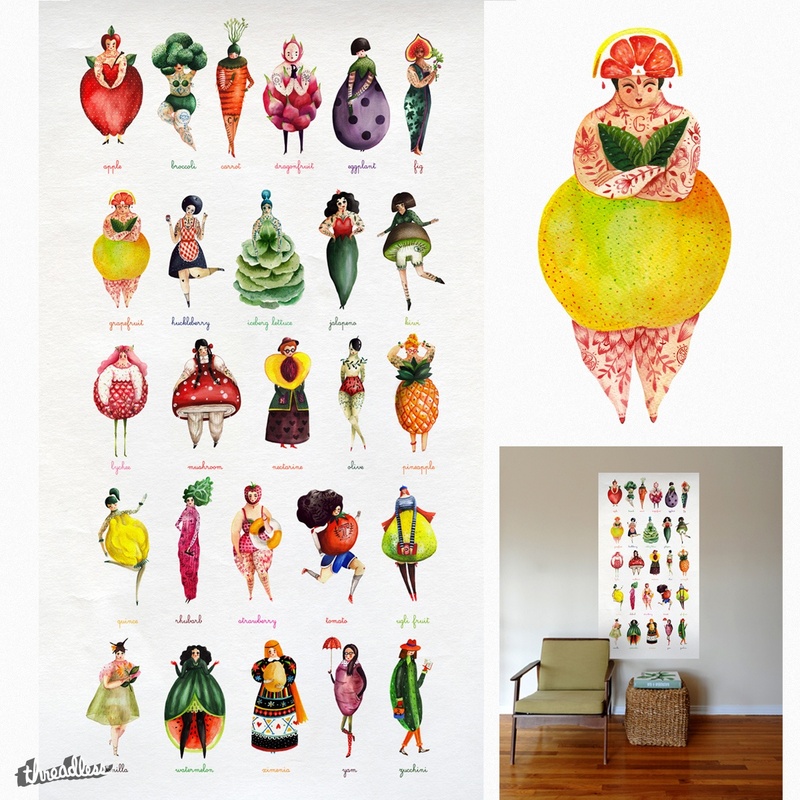 I loved this poster of cute illustrations of hefty and round women dressed as fruit and vegetables. I swear it may be the roundness of her characters that I gravitate towards, or it may be the choice of vibrant colors she uses to bring out their personalities. Was it available? Nope. I’m kind of upset at this point. I searched for her other works and found this last illustration. The detail and exaggeration of the redhead’s dress are adorable. Still no luck buying a small print or a shirt. I guess I’ll just stalk Threadless or Society 6 for some of her new stuff. You can view her artwork on her website here. I also found pink.aitch’s personal blog where she posts photos of her latest illustrations and projects.